The Pommerscher Greif just published that the Ortsfamilienbuch Demmin is now available online. Currently, the entries only consist of the years 1860-1900 from the military church book. More is to be added with time through future updates and corrections. A translation of David Krüger’s description can be read below. The first Prussian garrison in Demmin consisted of a battalion of the Lottumschen (Kalckstein’schen) regiment, which was built in 1713, and Anklam and Demmin received as a permanent base. This regiment was relocated to the Mark, respectively Berlin, in 1728. Anklam and Demmin were now given the newly built Thielsche, which was built as a fusilier regiment of 600 men of the Küstrin garrison and some of the old regimental teams. 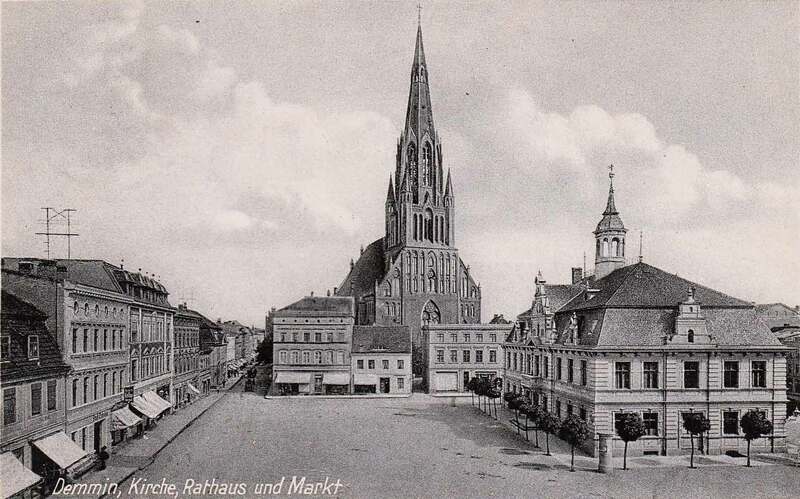 Further information on the history of Demmin as a garrison city can be found in the book “Geschichte der Stadt Demmin”, published by Karl Goetze in 1903. On December 4, 1860, the 2nd Pomeranian Uhlans Regiment No. 9 was founded and initially distributed to the locations Anklam, Ueckermünde and Treptow an der Tollense (today: Altentreptow). The staff and the 2nd squadron moved to Demmin in December 1860, the remainder on October 15, 1861. The Uhlan Regiment participated in various wars (1866, 1870/1871, and 1914-1918). Further information about the Uhlan Regiment and the garrison location Demmin can be found in the book “Uhlans in Demmin – The 2nd Pomeranian Uhlan Regiment No. 9” by Karsten Behrens. For the Ortsfamilienbuch, the military church book of the Garnisonsgemeinde was evaluated for the period of 1860-1900. A complete evaluation is planned until the year 1937. The database contains all persons from the military church books. Persons from church records were linked as far as possible to families. Despite all care, the Ortsfamilienbuch is not faultless. So it may be that by reading errors, several people with the same first and last name or erroneous entries that a false copy and link has been made. Be careful with the birth information, because often the age was only specified as “22 years, 8 months.” Please inform David Krüger if you have found further information about the families or mistakes. Pomeranian griffin e.V. and garrison association Demmin “9th lancers” e.V.